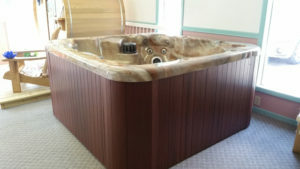 Hot Tub Supplies and Service- Complete wiring and repair services for Hot tubs from Wilson Electric. Since 1988 we have outfitted our customers with quality hot tubs and saunas so they can achieve maximum relaxation. We sell a full line of chemicals from Chlorine, Bromine, or Non-Chlorine to keep your hot tub (or pool) running at optimal performance. We also have a large selection of fun toys for the pool or spas. We provide Baquaspa, and Brilliance, for Spas and Baquacil and Poolife for Pools. Almost Heaven saunas, and cover lifts for your hot tub. Contact Great Lakes Spas/ Wilson Electric today at 989-831-4117 in Stanton for service or repairs or Greenville at 616-754-4440 .